One of the main themes of the holiday season in that of “spreading good cheer.” As we walk the public streets, malls, supermarkets, etc we hear its refrain. “’Tis the season to be jolly…” Now, I’ll grant that the demand for December mirth is geared toward Christmas, but Jews have joy in our holiday as well. The third set of synonyms for light is glowing or radiant. Radiating light means not simply keeping it to oneself, but rather sharing it (or in the spirit of the season, “spreading good cheer.”) It is a Chanukah imperative to place the lit menorah in the window for passersby to see. I cracked a window once doing this because of the temperature differential between the flames and the outside winter air, so take care to insure that you give it a little space! 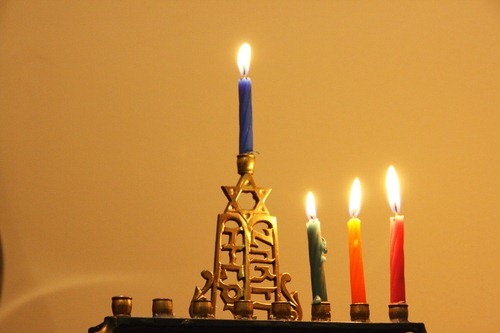 Chanukah is a great holiday to spread light into the world. It is a Jewish “tradition” to spend Christmas eating Chinese food and going to the movies, but I know an increasing number of Jews who spend this night at homeless shelters and soup kitchens helping others celebrate their holiday and warming that night with the light of mitzvah. Of course Christmas is a really popular time for volunteering, and I suspect the need for man-power may not be as high as on “normal” days. But while you are feeling inspired, why not mark your calendar to do this mitzvah on a future evening when help is so much more needed. We can be radiant by performing extra mitzvot. You can donate blood (if you are able), time, money, and energy to helping the less fortunate. I am very proud that Temple Beth Torah is housing the homeless this week (Dec 20-22) through Helping Hands of Rockland County. This season is very important for charitable organizations. Not only are people inspired by the holidays, but also by their taxes. Donations rise as people remember that now is the time to write their tax deductible pledges. The Jewish people are supposed to be a “Light Unto the Nations.” It seems to me that the “Festival of Light” is a good time to get moving on that lofty goal.